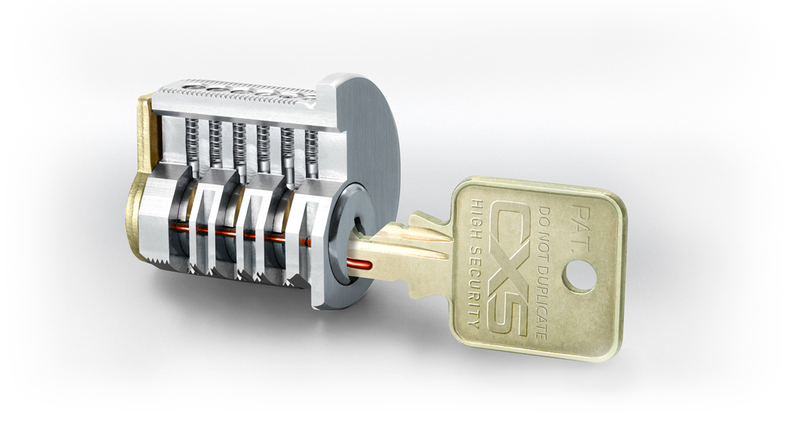 CX5 Technology was developed as an innovative and affordable solution to the limitations of common key cylinders in the fields of physical security and loss prevention. The development of this new security technology required high-precision manufacturing together with an uncompromising level of commitment to quality standards and practices. The objective was achieved with the development of the CX5 cylinder which requires a key with a unique security groove milled on the side of its blade. This CX5 technology has gained strong praise from security professionals. Despite the milled side groove, there are no special machines required to cut a CX5 key-blank. An authorized CX5 security professional can use any standard key duplicating or code cutting machines. The CX5 security groove is used to interact with spring-less side pins, which control an auxiliary locking bar, making CX5 cylinders less susceptible to being compromised than traditional pin tumbler cylinders. With managed keys, an auxiliary locking bar and enhanced protective features, CX5 cylinders not only protect against physical attacks but are virtually pick and bump resistant. By maintaining strictly enforced key control policies, geographically managed keyways prevent the widespread availability of any specific key blank. This strict adherence to control policies in key blank distribution supports all priorities in today’s security minded environment. CX5 cylinders are produced from high quality solid brass extruded rod material and are available in most popular architectural finishes. By default, cylinders are shipped without keys and no security groove sidebar pins. The pin tumbler chambers are “zero-bitted” with brass bottom pins, driver pins and stainless steel springs. The hardened steel anti-drill pins located across the cylinder plug face protect from drilling the top and bottom pins as well as the sidebar pins. CX5 non-IC cylinders are available with the optional enhanced UL 437 features for even greater security using stainless steel pins and added protective elements. © CX5 Security. All rights reserved.